Inside: We all want to raise kind kids. 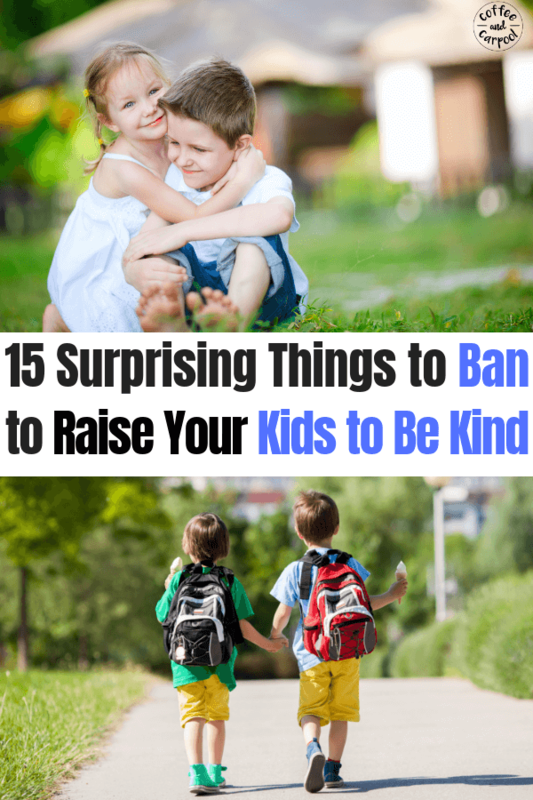 When you ban these 15 surprising things, you will raise kinder kids, and have a kinder home. My goal is to raise kind kids. And I will have done my job right if I raise my kids to help others without being asked, they know how to be a true friend and, they treat others with fairness and respect. I want my kids to be kind people even when they don’t feel like it. Even when others aren’t kind to them. So we work on it, every day. We talk about how they can be kind at school, and kind on the ball field, and kind at home to their siblings. We read books about being kind and how to be a good friend and we point out and label unkindness when we see it in movies, tv, books, and their own actions. Being kind is so important in our family, it’s one of our only two family rules. But to help support these two family rules, we have also banned these 15 surprising things to enable us to have a kind home. These 15 things may seem trivial or too small to be deemed important. And we all know that as parents, we have to choose our battles. But when we add these things up, day after day, these 15 things change the dynamic of our home. These seemingly little things change the tone of our whole home. They change how we speak to each other and how we treat each other. So even though they may seem trivial, when it comes to kindness and trying to raise kind kids, the little things matter. 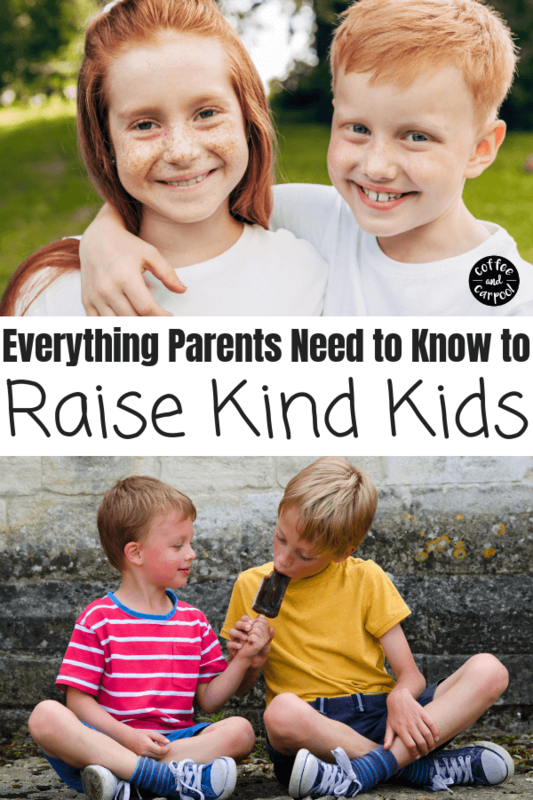 Why is a kind home and kind kids so important? It’s a time to test boundaries, learn right from wrong, and kind from unkind. From temperamental toddlers to hormonal tweens and teenagers, our kids’ job is to figure out who they are and how they will fit into our family, our community, and our world. And the world isn’t always the kindest of places. So we want our kids’ home–our home–to be a place we all want to be. We want our home to be a place where our kids feel safe to be themselves without getting ridiculed for it. A place where our kids can let their hair down and be their best truest selves without relentless teasing or ridicule by their siblings. A place where there is mutual respect and kindness amongst siblings and between kids and adults. Because we want our kids to not simply survive their childhoods, but to thrive during their childhoods. So while we also focus a great deal on creating positive sibling relationship between our kids, we have gone a step further. We have banned certain things from our home to create this positive home environment. And when we focus on creating a kinder home, it, in turn, creates kinder kids. It’s not easy to ban some of these things, but for our family, it has been a game changer in the way we talk to each other, interact with each other, and live together. Sarcasm can be funny. It can be amusing. But it can also be incredibly hurtful. When my kids were younger it was easy to not use sarcasm. No two year old would understand it. But now that we have a tween daughter, it slips in every once in a while. And she calls me out on it every time. And I’m grateful she does because when I’m using sarcasm, I’m not in a good place. I’m usually frustrated, angry or really tired. So I back up, apologize and rephrase my comment without sarcasm. And it takes away the meanness in my tone and meaning. 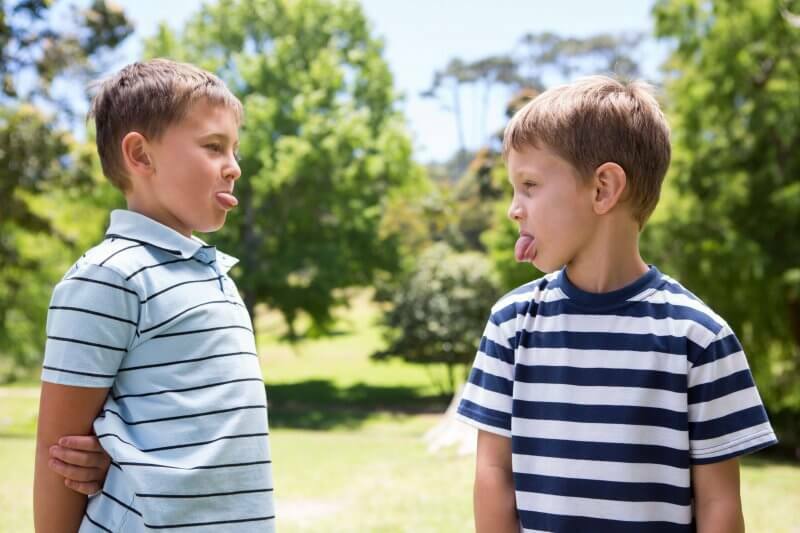 This one seems obvious, but name-calling goes hand in hand with labeling our kids’ behaviors. When my six-year-old cheats during a family board game, instead of calling her a “cheater” we tell her she’s cheating at the game and it’s not fair to everyone else. Instead of calling my daughter a “liar” when I catch her in a full blown lie, I tell her that she’s lying and not being honest and I won’t be able to trust what she says until she tells the truth all the time. We focus on the behavior we want to change rather than name-calling. Teasing can be good-natured and fun. But it can be taken too far in a very short period of time. And since everyone’s threshold for what they are okay with is different, the line between funny and hurtful can be blurry. Teasing can quickly cause someone to put up a wall to emotionally protect themselves. Comments followed with an “I was just kidding” or comments that start with “No offense, but…” lead to nowhere positive. Being teased when you sing off key prevents us from singing in front of others in the future. Being teased when you like a boy keeps my daughter from telling us about it. Being teased about picky eating keeps my son from trying new foods. Teasing hurts feelings and there’s usually no upside to it. So I remind my kids it’s easy for them now that they know how to do it. Because it wasn’t easy when they first tried it. Reading is easy for my second grader, but I have to remind him when he was in Kindergarten like his sister is now, it wasn’t so easy. It’s unkind to dismiss someone else who is struggling with a new skill. This may just be me, but being ignored makes my blood boil. I really can’t handle the disrespect and disregard that comes with being ignored. So I don’t allow my kids to ignore each other. But they still have to respond with something. Anything other than silence or blank stares. It’s unkind and hurtful when we share something we know, just learned, or wanted to share in the conversation with a “duh” or “I don’t care” dismissive comment. So we don’t “duh” or “I don’t care” each other in our family. These two things are banned in our house because they’re super disrespectful and mean-spirited. Eye rolling especially makes me irrationally angry because of how rude and unkind it is. I don’t allow my kids to do it all– to me or to each other. Balk talk or sassy comments are not okay in our home. We started using a two-word magic phrase that ends it all within seconds and it’s a game changer. This seems like a crazy one, but when my daughter announces that she is the prettiest or the fastest or the smartest, she automatically dismisses everyone else. My daughter can be pretty and fast and smart without being prettier or the prettiest. She doesn’t have to be the fastest or faster than her siblings, she can simply be fast. We practice how to compliment yourself and others without comparing. My husband and I banned these words early in our relationship and we’ve passed it down to our kids. Comments like “You never…” and “You always…” don’t end well for anyone involved. No one “never” or “always” does anything. We can have a disagreement without taking it down the “always” or “never” road. We don’t do secrets in our home. We can keep surprises for birthdays and holidays, but secrets aren’t healthy. They breed “I know something you don’t know,” whispering behind backs, and can protect dangerous and unhealthy behaviors. Private conversations are absolutely necessary, but when we have something to talk about that’s private, we do it in privacy. Not in front of someone else so they know we’re having a conversation they’re not privy to. It’s hurtful to feel left out, especially when it’s done on purpose. Every family has words they can’t stomach and therefore don’t allow. And if our kids hear it from a friend or a TV show or an adult in their lives, we remind them they can hear the words, but they can’t say them (this applies to cuss words as well). My daughter has been using snarky phrases in her comments we didn’t realize were causing damage. But when we started to listen to how sentences and meanings changed when we asked her to take out “even” “at least” and “actually”, the snarky, nasty, mean comments quickly morphed to kinder sentences. “Even,” “at least,” and “actually” are out. My kids get in the car and all of a sudden they all have to tell me something at that exact moment. They talk over each other trying to be the loudest so they get heard. Besides the fact I can’t understand anything any of them are saying, it’s also really unkind. When we interrupt or talk over someone, we’re telling them we think what we have to say is more important than what they have to say. It becomes especially unkind when it’s repeatedly done or on purpose. Entertainment that encourages or humorizes put-downs, teasing and a general meanness doesn’t work in our family. And if our kids are reading books like Junie B. Jones or Diary of a Wimpy Kid or watching TV shows where the main character isn’t kind and it’s celebrated, we have conversations about the behavior and language. 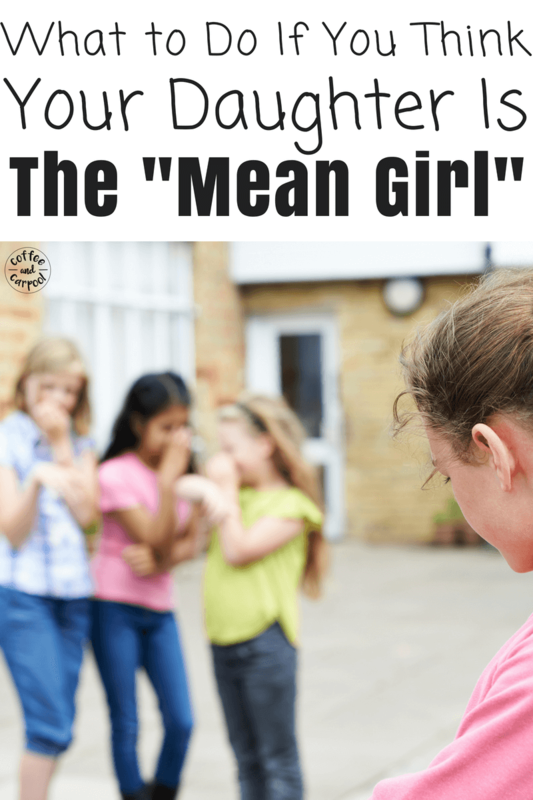 We point out what is kind and what isn’t kind, and remind our kids how the characters act and speak to their friends, siblings, and parents isn’t acceptable in our family. Because we all want to raise kind kids. We all want the world to be a kinder place. But it starts at home. Every day, with the small, trivial things. 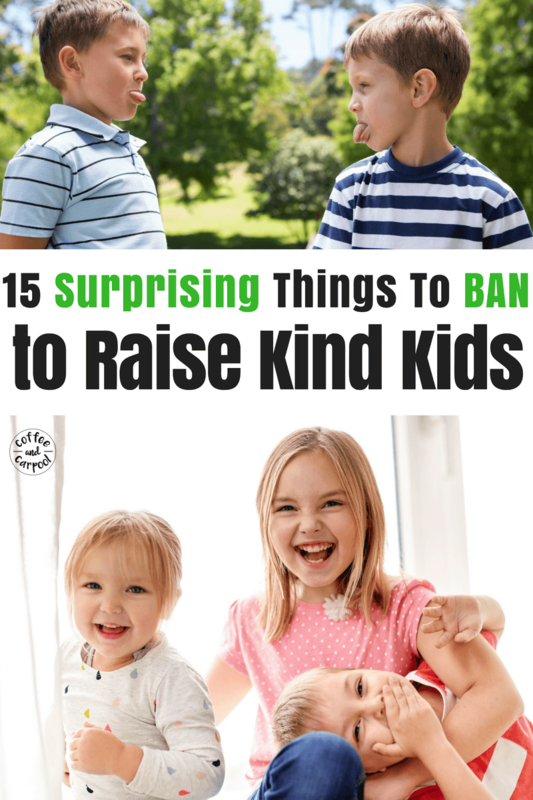 So if banning these 15 things makes my kids kinder, and our home a kinder place to live, then those are battles worth choosing. I have never commented on a Pinterest post. I’ve pinned hundreds. Exactly what I’m trying to do with my four kids excepts all organized for me in one list. I used to teach high school and if those kids would have been taught to do these 15 things, our high school would have been a totally different place. I plan to type out the lisf and talk through it with my kids and then let us all, including Mom and Dad, be held accountable for our words and actions. Oh, that silent one! That’s not just frustrating, it’s unkindess isn’t it?! Thank you Jenna! It’s the little things…like ignoring each other…that add up to the overall kindness of our kids! I’d love to hear how it goes! I am sarcastic by nature. I have really gotten much better over the years, because, as you said, 2 year olds don’t understand sarcasm. Neither does my son….he is strictly black and white in his thinking. So when I say, “thanks for leaving your dirty underwear in the hallway,” he actually believes I’m serious. I love this post!! Thank you for these wonderful tips! I have four children, and my oldest (7) is VERY into comparing and superlatives. How would you handle these situation and discipline him when he is persistent about these behaviors? I’m so glad! I don’t discipline for it though because it’s not purposefully hurtful. I just remind my kids that they can be pretty without being prettier or the prettiest. They can be smart without being smarter or the smartest. Or if they say I’m the fastest, I respond with, “You are fast” to model the language that’s kinder. Most of the time, kids don’t realize the power or weight of their words. This is excellent! I especially appreciate #4 about dismissing how difficult something is to someone who is learning it for the first time. That is something that I have seen over and over again in the children I have worked with and, sadly enough, in parents as well. Many forget how difficult things are when you are a small person. In addition to these things, we have banned the use of electronics while we are together as a family. It is amazing how much those little screens affect our ability to be kind to each other. Dismissing someone and their struggle is a common thing to overlook! So glad you found it helpful!